It is a beautiful day in late summer or early fall, and you've decided to get out and enjoy it. As you get out of your car and gaze around at the peaceful setting, you see a group of people peering toward the distant skies. Some of them are just using their eyes, some have binoculars, others have little telescopes mounted on tripods. Suddenly one of them points excitedly toward the distance and says "Bird over the grove". They all turn to look, and you hear them discuss what this bird might be. They must have good eyes because the sky looks empty to you. Suddenly you notice the smallest of specks, floating way out there. Surely that can't be what they are all looking at. And then one of the people says it's a Sharpie!, Another says it's a Cooper's! Even though you have no idea what they are talking about, you understand that they are trying to identify a bird ­­ not a plane ­­ that appears to be about as big as a period at the end of a sentence. They have got to be kidding!! You know enough about bird identification field manuals to realize that no one could possibly be seeing enough detail in that little speck to be picking out field marks on the bird's body... not even the people with the spotting scopes. As you watch, the speck becomes larger as it heads toward you. Finally you can vaguely see the shape of the bird. Even though you still cannot see any distinctive markings, most of the people around you are beginning to agree that it is a Sharpie and not a Cooper's. You are amazed... how could they possibly have seen adequate detail to feel confident enough to declare what it is? Where are you? Who are these people? You are at one of the local hawk watch sites where people gather to observe the fall hawk migration... or more accurately, the raptor migration. The raptors you will most likely see at a hawk watch site include various types of hawks, ospreys, harriers, eagles, and vultures. Occasionally you will also notice migrating monarch butterflies, hummingbirds, and song birds heading south. Many of the migration observation sites exist along the Kittatinny Ridge along New Jersey's Northwest border with the Delaware River; places like Raccoon Ridge and Sunrise Mountain. Another popular spot is the Scott's Mountain Hawk Watch, located further south at the inlet-outlet tower parking area on the western edge of Merrill Creek Reservoir, about 4 miles northeast of Phillipsburg, NJ. This site, which is on a major raptor flyway, is about 1000 feet above sea level and may be reached either from Route 57 near Stewartsville or Route 519 in Harmony. Volunteer observers have monitored raptor migration in varying degrees at or near this site since 1973. Scott's Mountain Hawk Watch has a good view of the Delaware River valley and Merrill Creek Reservoir, making it easy to see flying raptors in just about any direction. This hawk watch site has an added attraction: it is the best place to view Merrill Creek Reservoir's resident bald eagles, their nest and offspring. Some watchers are just casual observers while others are interested in keeping accurate track of the numbers of migrating raptors, posting daily counts on the Internet. Many new hawk watchers have learned the art of distant hawk identification from the congenial and knowledgeable raptor spotters at this site. The fall raptor migration season begins in late August and continues into early December. At least 15 different raptor species can be expected to fly over Scotts Mountain. These include the black vulture, turkey vulture, osprey, northern harrier, sharp-shinned hawk, cooper's hawk, northern goshawk, redtailed hawk, broadwinged hawk, red-shouldered hawk, american kestrel, merlin, peregrine, bald eagle, and golden eagle. Infrequently observers have also reported rough-legged hawks, kites, and even the rare gyrfalcon. If one type of hawk attracts the most people to Scotts Mountain , it would be the broadwing hawk because they tend to come through in groups containing vastly higher numbers than any other type of raptor. On their peak day, usually during the third week of September at Scotts Mt, it is possible to count thousands of them as they pass overhead in swirling flocks called "kettles". The one-day record for broadwings at Scotts Mountain was in 1983 when over 18,500 of them were sighted. (In case you don't have a calculator on you, that's about 13 birds every minute ­­ one every 5 seconds, if they flew in single file ­­ for a 24-hour period.) In 1999, just under 10,000 broadwings flew over in one day. In 2000 it was considered to be a "disappointing" day when "only" 6000 broadwings flew over on the peak day. Be warned, though, that these broadwings usually are flying very high overhead and most of them will be invisible to even the sharpest naked eyes. It may be surprising to learn that even with 10X binoculars many of these broadwings are nearly impossible to spot, as they take advantage of prevailing wind currents high above the earth. 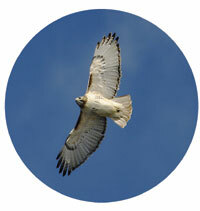 Identifying raptors flying over a hawk watch site is different than identifying them at closer distances. Approaching raptors are identified at great distances by wing angles, speed, flapping patterns, and flight characteristics. The markings given in bird identification books are used only infrequently. Most of the identifications are accomplished before the birds are even close enough for observers to see their markings. Due to the great distance that some of these birds might maintain from the observers, even 7X binoculars might not spot some of the distant birds in flight. A better choice would be 10x or 12x binoculars or a spotting scope. My binoculars of choice are variable-zoom, ranging from 7X to 15X but mainly set to 11X. You should remember though that higher magnifications will also cause the image to shake more. The inlet-outlet tower at Merrill Creek. While spotting scopes are not as easy to use as binoculars, frequently it takes someone with a spotting scope to resolve disagreements over the exact identity of a bird-in-question. Spotting scopes will range widely in price and quality, where the general rule is that you get what you pay for. I've been able to take a peek through various scopes of differing quality and can say that most of the high-priced, high-quality scopes offer breath-taking detail over most of the cheaper ones. However, I use a scope priced about 1/3 of the most expensive scopes, and it does a good job of showing me detail at 25X. As you watch these graceful creatures glide high overhead, remember some of them are coming from as far away as northern Canada, maybe even the Arctic. Many of them will be reaching South America before they finally settle in for the season. Even the monarch butterflies that you see are migrating to a distant destination a few thousand miles away. You'll understand why thousands of observers monitor and marvel over this phenomenon every year. Although many people know that eagles are successfully breeding in New Jersey few have ever visited the places where they can be viewed. In Warren County, one pair of parenting eagles can be observed at Merrill Creek Reservoir. The eagles' nest is across the reservoir from the Visitor's Center. Located along Fox Farm Road, the inlet-outlet tower parking area provides easy viewing access to the nest, yet keeps visitors at a safe distance. Nesting eagles at Merrill Creek. 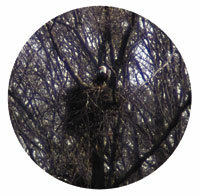 Although the eagle's nest is in plain view, it blends well with the trees, making it difficult to see at times. Most newcomers spend at least a few moments trying to find the nest. Even after locating the nest, it is difficult to see the eaglet without using binoculars. A permanently mounted public binocular at the parking area may be used by visitors who have no binoculars or spotting scopes of their own. A spotting scope of at least 20X power or higher helps. Despite the temptation to get closer, be aware that eagles are very sensitive to human intrusion into their territory. They have been known to abandon nests because humans have bothered them once too often. Marker buoys floating in the reservoir mark the proximity limits for boaters and kayakers who approach the nesting area. A sign or two on the shore warns hikers that they are getting too close to the nest. This year's eaglet is not the first to be hatched at Merrill Creek. By the winter of 1998, a pair of bald eagles had built at least one nest along the shoreline of an isolated cove in the southwest corner of the reservoir. In March of 1999 they successfully hatched their first eaglet. A year later, in March of 2000, the pair's second eaglet was hatched, and in 2001 the first set of "twins" was raised in the original nest. Over the winter of 2001-2002 the eagle pair constructed a new nest on the same projection of land as the original nest, this time on the side facing the parking lot of the reservoir's inlet-outlet tower. Viewing the first nest involved a 10-minute walk down a gravel slope but the new nest is conveniently located where observers need only park their cars, step out and look. 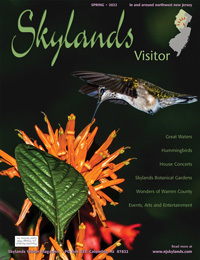 Not only is this handy for visitors; it involves minimal disturbance to the eagles. In March of 2002, the eagles produced their second eaglet pair, hatched and raised in the new nest. Last year, in 2003, tragedy struck when that year's brood died just a few days after birth. This spring, yet another eaglet entered the world at Merrill Creek. Keep your camera ready at all times < and you might be lucky enough to get a shot like this! You never quite know what you'll see in the nest. At times it will appear to be empty because the eaglet is laying low, out of sight while the adults are elsewhere. At other times, both adults remain near the nest in which the eaglet seems to dance as it exercises its young wings, getting ready for its first flight. At other times, the eaglet remains motionless, observing the world around it. Young eagles take their first flight in early to mid-June. As that time approaches, the crowd of observers seems to increase, hoping to be there for the eaglet's first venture from the nest. Considered to be a graceful, regal bird, it's surprising how clumsy those first days of flight can be for the young eagle. Two years ago, one of the young eagle's first encounters with flight came as it lost its balance and toppled out of the nest, flapping its wings madly as it tried to stop its fall. It caught itself on a limb a dozen feet below the nest, staying there for hours while an adult eagle seemed to try to coax it back into the nest. 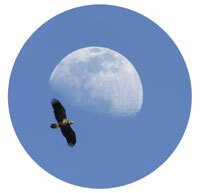 Observing the eagles' nest can mean enduring hours of inactivity. Eagles are very efficient creatures, preferring to perch motionless while they wait for just the right moment to capture their next meal. But then, without warning, one will suddenly fly away from the nest area, dive down at the water and pull out a fish. 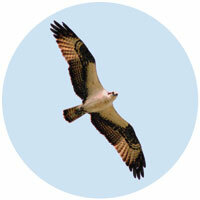 During the warmer months ospreys circle and hover, joining the hunt. Sometimes, when an osprey successfully captures a fish, an eagle might chase it, hoping to frighten the osprey enough to make it drop the fish. If he succeeds, the eagle may then catch the falling fish in mid-air, a show that is well worth the wait. Even if the eagles are not active, other birds will make your visit exciting. Cormorants are usually nearby, or maybe even a loon or two. Harriers glide back and forth, low over the fields, looking for their next meal. Whether you are lucky enough to meet the Merrill Creek eagles or not, your visit will be relaxing and rewarding.